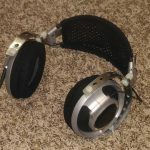 I bought a set of used Sony MDR-SA1000 headphones off eBay about a decade ago, and it was my first pair of headphones that were worth more than $30 or so, retail. I fell in love with the sound almost immediately, especially after I paired it with a capacitor and opamp-modded used Dell OEM Sound Blaster X-Fi Xtreme Music. Unfortunately, a friend of mine sat on them, and the notoriously weak connection between the headband and cup broke. I tried various glues to repair them, but they would just keep breaking at the joints. 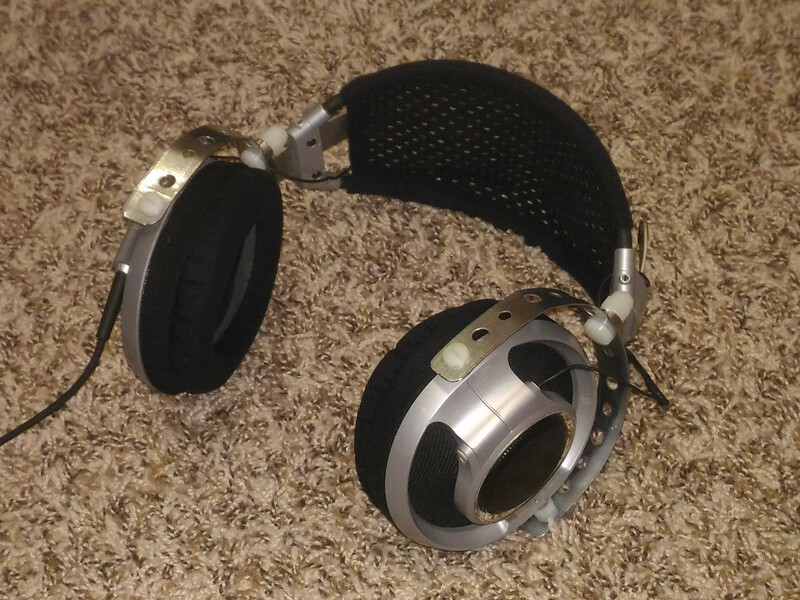 I eventually replaced them with the (IMO inferior, but still pretty good for the price) Philips SHP9500. The broken Sonys sat in a box for years, because I didn’t have the heart to throw them out. 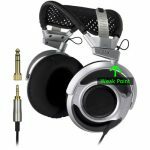 Recently, I ordered a pair of Audio Technica ATH-AD900X headphones, which I hoped would bring me back the sound signature I missed (It didn’t, but I wouldn’t say the ATH-AD900X is worse. Just different. Better, by most accounts.) It was while I awaited delivery that I decided it was time to either seriously try to fix the Sonys or throw out that dusty old box. So I tried, and this is the result. I didn’t take pictures of the process, because I wasn’t sure that it would work. Between the pictures of the outcome and the forthcoming description, I hope other people can reproduce or improve upon this. You’ll need a few parts. I sourced the plumber’s tape and nylon parts at Ace Hardware, where they were much cheaper than getting them on Amazon. However, if you want to be nice to me, buy them through these links and Amazon will toss me a penny or two. 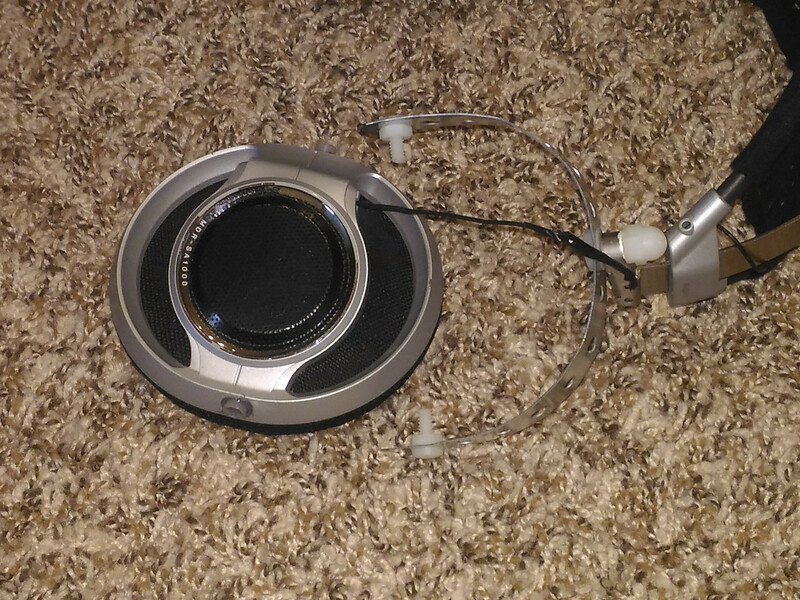 First step is to disassemble the headphones and discard the broken half-moon hinge that attaches the earcups to the headband. Remove the screws covering the hinge where it connects to the adjustment plates, and disassemble the cups (screws are under the pads) so that you can gently manage the removal of the half-moon clip. You will have to either cut or desolder one end of the wire which runs between the cups, because we will string the wire through a different spot on the cup. Once the clip is detached, you may throw it out, as well as all of the plastic parts that hold it to the adjustment plate. Further disassemble the headband so that you can get the cable out of the rubber tube underneath the headband webbing. While you have all of this stuff apart, now would be a good time to put those nasty earpads through a gentle wash cycle… the pleather will get taken off, but will leave a relatively nice felt that was underneath. 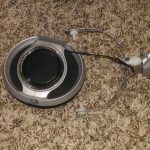 Once you get all of that out, drill and file out the holes on the sides of the cups, enough to fit the plastic bushings snugly, but not enough to prevent the #10 screws from fitting. Take care, also, to try to get the bushings positioned into the same axis, as much as possible. Use the J-B Weld to secure the bushings in place and fill in the rest of the hole. I put the flange part on the inside (before I had settled on the final design), but outside would be easier and probably better. It will be necessary to remove four black tabs from the driver housing parts (two tabs on each), which held the old moon clip in place. Cut two pieces of the plumber’s tape to about 8″/20cm in length. My tape had large and small holes; the large holes were 1/4″, and I aligned one in the center. The small holes, I aligned one on each end. File down the sharp edges. 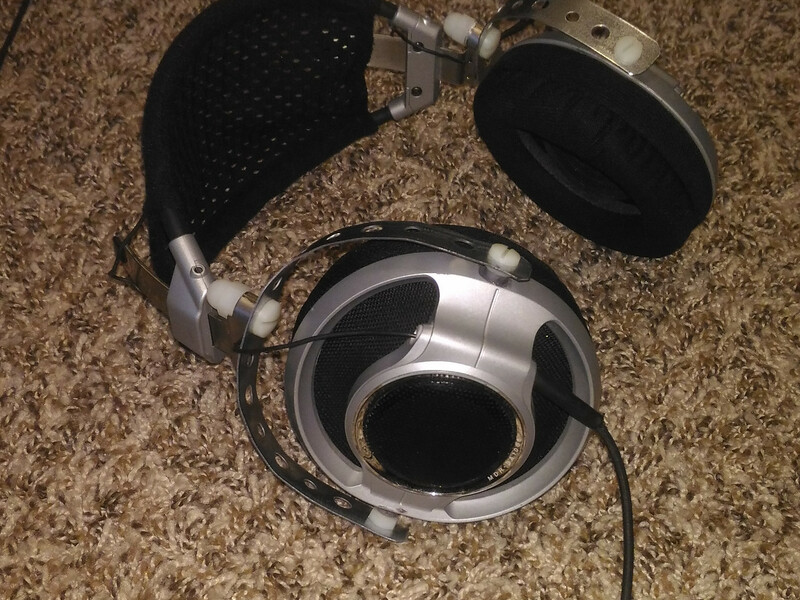 Bend the pieces of metal to the shape of the earcup. Note that it will bend more where the large holes are widest; you may like the look of this, or you may not. On the left cup, the source cable hangs out of a hole that is just outside and to the bottom of the driver. In a similar location on the top, there is a little rubber plug. Remove the top plugs on both cups; cut them in half lengthwise, or take off a little less than half. Reassemble the headband, routing the wire underneath the headband webbing, and make sure to string the wire through the holes that the rubber plugs left behind. Replace the half-plugs, which will help to secure the wire. You can now pretty much assemble the rest of it according to the pictures here; should be rather self-explanatory. You will have to trim all the screws to get snug fits; adjust to your own preference. You will also have to cut a notch into the cap nut in order for it to fit neatly to the adjustment plate. Use a bit of the plastic glue to prevent the nuts from backing out. The screws that hold the cups are kept in the bushings by tensioning the plumber’s tape. Finally, reconnect the wire that goes between the cups. If you cut them like I did, this is where you solder them back together, and use the electrical tape or shrink tubing to protect the connection. All done. Now, the headphones are a little heavier than before, but more robust.